5. My Name is Earl--too driven by a concept plus narrated by an annoying voice. Let Randy do it, Earl. This is the kind of book I used to read all the time twenty years ago and now I remember why. 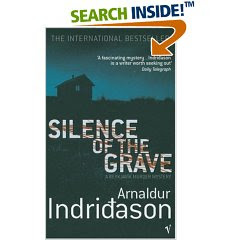 Indridason is a master at plot, creating memorable characters, and evoking Iceland during World War II and today. His detective has a compelling personal life, is likeable and gets the job done. Indridason balances POVs masterfully-there's never a moment when you wish the writer would get back to solving the mystery. I can't think of anything that didn't work in this book and this is from someone with adult onset ADD. I will certainly seek out his first book, Jar City. Would Hillary Clinton be permitted to continue on her bid for the presidency if Bill had cancer? I think not--despite their flawed and strange marriage. Not tending to him would assure her defeat. What do you think? My writing group read the first two chapters of the novel. None of them write solely crime fiction although several have dabbled in it. They felt the protagonist was so dark in these first two chapters that I had no where to go with her except toward the light. What do you think? Can I sustain this darkness throughout the book when everything is filtered through her eyes? Would she grow tiresome by the end? The book is written in the third person but she is definitely our only POV. I guess I'll post this on crimespace too since that's where the action is lately. At my writing group last night, a fellow who was reading the Bond series again after many years, observed that Bond seemed like the first metrosexual to him-- what with wearing cologne, talking about his clothes, taking about food and wine. Was this consistent with the times or was Bond ahead of his time in his interests. Can you think of other fifties-sixties era crime fiction heroes who shared this qualities. Spenser can a bit later, I think? Who could not admire a woman who was the first person to put a welcoming comment on Confessions of an Idiosyncratic Mind when I subbed for Sarah last summer? Yes, she is the one who opens the door for newcomers and ushers them in. This is a rare and wonderful thing. Oh and there's the little thing of her being a fantastic writer. That's pretty amazing too. Congratulations to LL for making the list. I bet she climbs higher still if the display in our local Borders is any indication. "I don’t think of men as evil, more like luscious..."
Now I see why this guy's been on a downward spiral since Three Kings and Flirting with Disaster. This is not a political blog so I will leave it at two words: four years. As I move farther away from writing short stories, ideas appear before me like formerly beloved children who have now been consigned to orphandom. Yesterday two ideas popped up unbidden. One- a woman told me the story of how she was being stalked by a woman who is incorrectly convinced she is having an affair with her husband. Two-a former colleague's daughter has had him institutionalized after the death of his wife and is selling everything of his she can get her hands on while he waits for a psychiatric hearing. Only today, a woman on the bus was dressed entitely in beige. Now this would not be that interesting if she had on some designer beige outfit. But she had on beige jeans, running shoes, gloves, hat, coat, purse, bookbag and scarf. Not another color in sight and no patterns either. Why beige? It's easy to say file these ideas away for when the novel is complete, but I lose the voices. Does that make sense to anyone out there? Although I know all the blog traffic is over on crimespace nowadays, here's a question. Is it just me or is the NYT suddenly printing more negative reviews of novels than positive ones? Today the new Leithem and Shriver books got run over pretty good. It seems like in the past if you got reviewed in the NYT it was usually a good review. Now they often review books negatively--sometimes even more than once. I'm thinking of the Jane Smiley book which got multiple poor reviews. Do NYT book reviewers get more mileage out of a bad review than a good one? I'm not thinking about Marilyn Stasio here who generally picks books she likes to review but the literary novel bunch. Can anyone think of examples where the expected crime does not take place and yet the story is still satisfying and you don't feel cheated? I've written myself into that situation. This is why I like short stories. You don't spend enough time with the protagonist to fall in love with him/her and want to save them from the original ending. Thanks. Does Amazon have intuitive powers? Okay, is it just me or has Amazon begun to pick up on books you might want to read and started featuring them on your amazon homepage. Today I was looking for novels on sixties radicalism for my husband on crimespace and some of the ones mentioned appeared without my searching for them. No kidding. It's like I searched for one and the rest of them magically appeared. This has happened before. A few days ago I said I was looking forward to reading Priest by Ken Bruen and there it was the next time I opened Amazon. It's pretty freaky. And it's not just with books. I mentioned aloud that I need a new pair of walking shoes and bingo, there's a shoe by Merrill on the site. Or I hear bits of the soundtrack from Pan's Labyrinth on NPR and--well, you know. Is it just me? Are you going to write this story or should I? Talk about a movie being completely dependent on one performance (Chris Cooper's)-this was it. The other performances seemed very dully conceived. When was a government boss not exactly like the Laura Linney character and when was a young agent not like Phillippe. I also don't understand why Hansen was so susceptible to what seemed like the amateurish machinations of the younger O'Neil. If he had been able to outwit virtually every agent for twenty-years, why did he fail so badly here? The lure of a Catholic mentee couldn't be that blinding. Perhaps someone who has read the book can enlighten us. Best line: "I am much safer if you know little about me"
Walked around Belle Isle trying to steep myself in it for the novel. It truly makes me want to cry. If you're from Detroit, you know why and truly it's about poverty and not racism. The one bright spot was the fabulous greenhouses. Truly amazing. It was a long car trip to Cape Cod. Neither of us enjoy such things. My husband doesn't usually enjoy audio books and decent radio stations become scarce. Music can only take you so far. I shuffled through a group of audio books I had picked up at the library and picked out "The Dramatist." My husband and I barely exchanged another word as we became part of Jack Taylor's world. Although I had/have read other Bruen books, this one was just about tore our hearts from our chest. Thanks, Ken, for the only enjoyable car trip we've ever taken. For some of you who have written pieces that exceed 20 pages, here's a question...If I am bored with writing a section of this so-called novel, can it possibly NOT being boring to read it? I mean-- do you ever get bored with a section of your novel. Should every chapter knock the reader off his feet? In a short story, you can keep the flags flying at full mast, but should you expect it in a novel? You get what I'm saying now that I've bored myself and you saying it six different yet exactly the same ways. When do you hit delete? Last week, an entry on here that mentioned "friends" drew three comments from people obviously trying to sell me something (greeting cards, I think). There must be a program that picks up mentions of "Friends" automatically. Has this happened to you? Using the Internet for various good and bad purposes is only natural, I suppose. God knows, I get emails from perhaps two or three dozen politicos each week from Union for Concerned Scientists to my local congressman, to Hilary and Bill, and so on. I sign a lot of petitions and have perhaps become careless in what I sign. Do you share this problem too? I know I signed a bunch of petitions to register my ire at a possible pardon for Libby this week. I'm sure my name is on an enemies list somewhere but so is yours probably. Does any of this do any good? Wasn't marching in the street more effective? How do we affect change in the era of the Internet? Is the Internet at all effective in this? How Far Will You Go for Friendship? A friend who we dearly love suggested that we go see Wild Hogs Friday night. Because I am deeply neurotic and never see a movie unless it has gotten fairly good reviews, I checked it out on Rotten Tomatoes and saw that the more credible critics came down 6% positive on Wild Hogs. So I vetoed it. We had planned to see something else so he conceded it. Over the years, I have seen movies with friends I would not have chosen on my own--mostly horror and war movies. The first scares me, the second bores me. But if the reviews are okay, I will usually give in. The four worst ones , I was talked into were The Songcatcher, What Time is it There? Sum of All Fears and a pastiche of cartoons I believe was called Looney Tunes . These movies are all different genres and different friends invited us to see them--all with good intentions. As far as Loony Tunes, I didn't like cartoons as a child, so there you are. In trying to submerge myself in the culture of death I came across this book and eventually a movie that deals with a strange phenomenon that happened in Wisconsin in the 1890s. Due to an economic downturn and disease a lot of people there died (especially children) went mad, committed strange acts. Lots of very strange acts, both lethal and not. The movie is well worth seeing although extremely morbid. The book written many years earlier than the film has the newspaper accounts of the time and photographs of the dead. Anyone know any more about this? I'm into death so help me out! Don: The posting where we were communcating got deleted inadvertently. Feel free to comment here instead. A story of mine called "Quality Operations" appears today on Hardluck Stories. I'll add the link on the side. I know you’ve told me I must not email you again, and that you won’t, in fact, open emails bearing my name. And, if you happen to open one and discover it’s from me, you’ll immediately delete it. The snippy departmental secretary also informed me that you’ve opened a new account and access is limited to non-student email addresses. How do you expect me to get a hold of you? By chance, I came across your blog today on a google search for badminton sets. Who would have guessed you’d choose the name Badman for your blog? It is you, isn’t it? Although the sexual references in your posts initially threw me off, I eventually recognized your list of “favorites.” You do talk about Godard films a lot in class, and I know your favorite composer is Arvo Part. His music was often playing during your office hours before I was forbidden attendance. Yes, the Arvo Part references really gave it away. I couldn’t resist using the comment portion on your blog to remind you that I didn’t plagiarize my paper. I know you found a somewhat similar essay on the Internet using your sophisticated spy software, but my occasional use of, “Women Who Lie in Bed in the Literature of Dickens” by Gavin Brighton was strictly an homage. (In case, you are unfamiliar with the term, please consult Wilkipedia). Another thing to keep in mind is I’m not an English major, Dr. Goodman. For eighteen years, my mother placed increasingly difficult words on my pillow in preparation for the SATs so please don’t hold this burden against me and say I can do better. I’m only enrolled in your course to fulfill my humanities requirement. To expect me to meet standards designed for English majors is unfair. In case you’ve forgotten, I am majoring in Phys. Ed. I can wrap my legs around my neck. I would be glad to demonstrate this during your next office hours if you will just send that security guard away. I think you’ve witnessed my agility in class. (I am referring to the unfortunate incident that led to student complaints about the inadvertent display of my genitalia). Removing my comments from your blog doesn’t mean you didn’t read them. A brief response to what extra credit I could undertake to raise my grade is not much to ask. I am hoping to enter medical school in 2010 and need a 4.0 to assure admittance. It’s time to let me put a childish mistake behind me. Another point to consider: there’s a distinct possibility my participation in the vault and floor exercise will enable Team U.S.A. to defeat the Russians in the 2008 Olympics. An awkward blemish on my record might prohibit this. I know you don’t want to act unpatriotically, thus playing into the hands of international terrorists and the Romanian team. P.S. You get some very unusual comments on your blog, Dr. Goodman. I wonder if Mrs. Goodman ever reads it. I came to your office hours on Monday, but again you were absent. The security guard, Moe Albani, and I had an interesting conversation about what constitutes temporary insanity. We agreed it differed from state to state, but certain aspects remain constant. I must remind you that the exact time of your office hours was on the syllabus you handed out in September. This document functions as a contractual obligation. I had a new paper on hand to replace the one you insist is plagiarized. And although Moe Albani and I had shared our innermost thoughts on insanity minutes earlier, he stubbornly insisted I must hand the paper to you directly. Standing outside your office has definitely soured him and I am not so sure that we will remain friends. I think it’s unfair of you to appeal to readers of your blog to come to your defense. Pasting my paper there was unprofessional. There must be university regulations on student privacy that forbids it. That comment by Molly A. was especially cruel although I do think you solicited such remarks by going on too long about my egging of your office door. I admit my original paper for your Victorian Literature class was sophisticated for a freshman, but please remember I worked for several years at Sports Authority before beginning college. I also competed in gymnastic events across the state, possibly picking up a veneer you might not expect to find in a girl of twenty. You’re making me angry, Dr. Goodman. Have I created a blog where I make fun of you? Have I sought a public forum for my grievances? I think you know the answer. Perhaps your chairperson would want to know how blithely you’ve addressed student concerns. I’m sure he/she would find your blog most interesting, Badman. I was released from police custody today and am back in my dorm room with my beloved stuffed animals and photographs of my favorite gymnasts. Right now I am gazing at a picture of Olga Korbut and wondering if her thighs were as strong as they look. The police pathologist decided Dr. Goodman was strangled by an unknown assailant. Since my hands were badly bruised from my fall from the balance beam, it couldn’t have been me. He didn’t once consider the use of thighs as a weapon. Finding your blog and its discussion of Dr. Gs favorite sexual practices was fortuitous, Mrs. Goodman, and I’m glad we became friends. Who knew my homage to an obscure (or so I thought!) paper on Dickens would bring us together? I have filled out the paperwork to transfer to a school in Oregon noted for its gymnastics program. BTW, I see you have removed both Dr. Goodman’s blog and your own from the Internet. Good idea, Goodwoman! Take a look at Brian Ochab's short film. He's trying to get on the Fox TV show called The Lot, which helps aspiring filmmakers. He's a talented magician as well. If I had to use one word to describe Zodiac it would be meticulous. Every scene effortlessly feeds into the next one. This is a story of obsession and how it destroys the men in both the police department and in the media who become involved with this case. The acting is very fine--although I have to say I've seen the Downey performance before. I'd like to see him cast in a movie where he doesn't play a character with alcohol and drug issues. The movie also looks good. Gritty. Rain seems to glimmer off every surface. The period details are great. My one criticism would be the length; it feels longer than it even is since it is relentlessly hyper-focused on the Zodiac case. However, the last hour is the strongest so that helps enormously. Hey, I lost my toolbar where I might have shown a picture. Does anyone know where it went and why? Maria, are you out there? Sandra brought up the importance of finding the right name for a character. It is a chore sometimes. Anthony Athos in your next crime story. A perpetrator, a victim, a bystander, a reporter, a cop. I wonder if any of us read a name the same way.